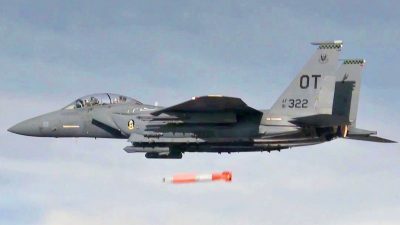 The new B61-12 nuclear bomb – which the US is preparing to send to Italy, Germany, Belgium, Holland and probably other European countries – is now in its final stages of development. This was announced by General Jack Weinstein, deputy chief of staff of the U.S. Air Force, responsible for nuclear operations, speaking on May 1 at a symposium of the Air Force Association in Washington, in front of a select audience of senior officers and military industry executives. The program provides for the production of about 500 B61-12’s, beginning in 2020, for a cost of approximately 10 billion dollars. (This means that each bomb will cost twice what it would cost if it were built entirely of gold). The many components of the B61-12 are designed in the Sandia National Laboratories of Los Alamos, Albuquerque and Livermore (in New Mexico and California), and produced in a series of plants in Missouri, Texas, South Carolina, and Tennessee. The bomb is tested (without nuclear charge) in the Tonopah Test Range in Nevada. The B61-12 has entirely new “qualities” compared to the current B61 deployed in Italy and other European countries – a nuclear warhead with four selectable power options; a flight system that guides it with precision onto the target; the ability to penetrate into the subsoil, even through reinforced concrete, and explode at depth. The greater precision and the penetrating ability make the new bomb suitable for attacking command-center bunkers , so as to “decapitate” the enemy country. A 50 kt B61-12 (equivalent to 50 thousand tons of TNT, three times the Hiroshima bomb) that explodes underground has the same destructive potential as a nuclear bomb of over one megaton (one million tons of TNT) that explodes on the surface. The B61-12 can be dropped from the US F-16C/D fighters deployed in Aviano, and from the Italian PA-200 Tornados deployed in Ghedi. But the new F-35A fighters are needed to exploit all the capabilities of the B61-12 (especially its guidance system). This involves the solution of other technical problems, which are added to the numerous problems that occurred with the F-35 program, in which Italy participates as a second-level partner. The complex software of the fighter, which has been modified over 30 times so far, requires still further updates. Modification of the 12 F-35’s will cost Italy approximately 400 million Euros, which must be added to the still unassessed sums (estimated at 13-16 billion Euros) for the purchase of 90 fighters and their continuous modernization. This money will be State-funded (i.e. using our money), while the money from the production of the F-35 will end up in the coffers of the military industries. The B61-12 nuclear bomb and the F-35 fighter, which Italy receives from the US, are therefore part of a single “parcel bomb” that will blow up in our faces. Italy will be exposed to further dangers as a forward base for the US nuclear strategy against Russia and other countries. by adhering to the UN Treaty on the Prohibition of Nuclear Weapons. Is there anyone, in the political world, willing to stop practising ostrich politics?